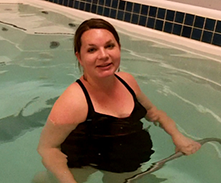 Many clinicians who have successfully added aquatic therapy equipment to their practice have seen positive treatment outcomes in pregnant women. As a low-impact therapy, aquatic exercise is ideal for pregnancy pain relief. Increased buoyancy, greater flexibility and less risk of falls have all been cited as common benefits of aquatic exercise. My ankles and hands are so swollen, it really makes it hard to stay active because all I want to do is put my feet up . . . I noticed that after I got out of the water my ankles were pretty decent. I felt really good. And it feels good in my hips and other areas where I’m carrying so much extra weight, it just takes the pressure off. It feels really great. The female body endures many changes during pregnancy, the effects of which can cause many different physical ailments. Water exercise can be extremely beneficial during this time. Relaxin is a chemical released during pregnancy to prepare the pelvis for movement during childbirth and helps to loosen ligaments. Although this is extremely helpful for childbirth, it can cause mild to intense back pain throughout an entire pregnancy. Aquatic therapy can provide relief in multiple ways. The warmth and buoyancy of the water offers relief from back pain by relaxing tired muscles and removing up to 80% of one’s body weight. While removing bodyweight for exercise can be beneficial for everyone, those with the added weight of pregnancy gain additional relief. The difficulty with back pain during pregnancy is that the best way to avoid the pain is to strengthen muscles in the core. Exercising can be difficult while pregnant and particularly uncomfortable. In the water, aquatic exercises can be done to strengthen the core and leg muscles to help mitigate the back pain and reduce it moving forward. Doing these exercises in water are easier due to the reduced weight and reduced effects of gravity. The laxity of the ligaments during pregnancy also increases the risk of injury during exercise. Water creates a safe place to exercise where falling is not a risk. The safety that water provides is ideal to continue working out during pregnancy. A study in the Journal of Obstetric, Gynecological & Neonatal Nursing states that exercising even just one time per week in water can reduce back pain up to 50% compared to land-based exercise. Weight gain is another factor that also leads to increased back pain. Although weight gain is inevitable during pregnancy, water therapy can reduce the effects. By reducing one’s weight by up to 80%, movement is easier, pain is decreased and relief is finally felt. One of the big fears one faces when becoming pregnant is the fear of gaining too much weight. Although healthy weight gain is important for the growth of the baby, many people want to find ways to control their pregnancy weight. Keeping up with exercise during pregnancy is typically safe, and suggested, in order to help the weight come off faster after pregnancy. As time goes on, typical exercise methods may become uncomfortable and exhausting. Aquatic therapy offers a medium in which to workout while staying comfortable without overdoing it. The viscosity of water also adds resistance without adding weights, which means that exercise can continue to be effective without adding strain and pain to one’s growing body. Staying active will keep excessive weight gain at bay and keep mom and baby healthy. Another common side effect of pregnancy is swelling in the legs, ankles and feet. Water is an ideal environment for relieving some of the swelling. The hydrostatic pressure of water naturally increases circulation and decreases swelling in the lower extremities. Hydrostatic pressure is defined as the weight of water on one’s body in all directions at the same time. This increased circulation drives the fluid upward in the body, resulting in decreased swelling.According to a research study at the University of Idaho, water therapy can cause improved sleep patterns. For pregnant women, this can have dramatic effects. Oftentimes, sleep becomes more difficult later in pregnancy, when it is most important. Exercising in water can provide the extra boost one might need in order to get a good night’s sleep! Water exercise can be beneficial for baby too. It has also been seen in studies of pregnant women, that aquatic exercise can show less fetal heart rate changes during exertion than land exercise. Things to note: consult a physician or physical therapist before using aquatic therapy when pregnant. Although it is safe and effective for most healthy pregnant women, your doctor will know what is best for you. Ken is a business professional who began working out in March, 2007 in ACCUA’s HydroWorx pool. His goal was to lose weight in an efficient manner, maximizing his exercise time. In six months of working with Chris Kost and Dan Kallberg, Ken has lost over 50 pounds and continues his amazing, healthy progress. There is clinical evidence to suggest that regular aerobic exercise can actually reduce the pain of labor and delivery. There are many ways to perform water aerobics. Exercises such as underwater treadmill walking or jogging, agua jogging and mild aerobics can help to keep cardiovascular endurance high. In addition, any exercises can that can be done on land, can be done in the water. Water increases buoyancy by as much as 90%, and many patients find it easier to stretch their lower backs and legs without strain in an aquatic environment. Doing exercises like squats and stretching are much more comfortable in the water when pregnant than on land. Using flotation devices can add extra resistance to exercises. By doing exercises in water, one is naturally working on their core stability as they work to stay upright while the water provides forces from all directions. Muscles are engaged and lengthened while they work to keep you balanced. The use of resistance jets can be added to further strengthen core muscles, by performing back presses or side bends against the jets. HydroWorx therapy pools come with massage hoses that can be attached to resistance jets to simulate the effect of deep tissue massage, promoting blood flow, reducing pregnancy back pain while stimulating the production of dopamine and serotonin. HydroWorx products have been developed with the needs of physical therapists in mind, incorporating research from health experts and other clinicians into their design. Visit our research page for a full bibliography of relevant studies. There are a few things to consider when looking into performing aquatic therapy and exercise with a patient during pregnancy. Stay hydrated while working out in water. Being surrounded by water can cause a false sense of hydration. When your patients don’t feel themselves sweating in the water, they may not notice that they need to rehydrate. Keep water nearby and make sure they drink often during exercise. Don’t overdue it. Working out in water can sometimes feel “easy” without the impact of one’s full body weight. Again, warm water therapy can be deceiving in that the ease of performing the aquatic exercises can cause one to overwork. The exhaustion can come quickly once your patient steps out of the pool. Consult a physician before offering aquatic therapy when pregnant. Be sure the client has consulted a physician before offering aquatic therapy when pregnant. Although it is safe and effective for most healthy pregnant women, doctors will know what is best for any specific individual. Aquatic therapy has proven to offer an additional revenue stream for physical therapy clinic owners. By offering a diverse array of services for a wide patient mix, physical therapy clinics can bring in revenue from sources other than medicare and/or insurance. Many facilities offer hours for the public to use the pool for a per use fee or a monthly membership fee. This broadens the scope of where revenue is coming from. By marketing the pool to local obstetric physicians and doctor’s offices, referrals can begin coming in, especially when they are convinced that aquatic therapy at your clinic will benefit their patients. When you purchase a HydroWorx fitness and therapy pool, our team will work with you to help your practice get the best return on investment. We offer marketing assistance and customer support to all our clients. HydroWorx products are trusted by professionals in hospitals and physical therapy clinics throughout North America. We offer a number of flexible products for professional use. Best of all, you can enjoy all the benefits of a HydroWorx therapy pool for as little as $1,220 a month. Contact us today for more information, or to order your free informational DVD!